This article first appeared in Crest. Once upon a time, it was easy to tell one kind of photograph from another. Photojournalists documented real life while commercial photographers fabricated a happy one. The former relied on the immediacy of the camera’s image-making technology; the latter utilised its ability to lie persuasively. There was respect for the former and a certain contempt for the latter. All in all, the two genres of photography were as different as chalk and cheese. Then, in the 1960s, the third genre began to slowly evolve in the West: fine-art photography. These were artists who chose chemicals, silver and the camera as their tools. Their works were often journalistic, but there was also beauty in them. photographers were regarded disdainfully as fabricators of the pretty, soulless reality that a client demanded of them. But staging a photograph is no longer a no-no in Indian fine-art photography. The notions of what makes a photograph artistic are changing. “When you say you are a fine artist, you are saying, ‘I am making this piece because it’s a representative of me and who I am’,” says photographer Manjari Sharma, a Mumbai girl now based in New York. “You have no one to hold accountable but yourself. What makes my style fine art is that when I’m making the picture, I’m aiming to fall in love with it myself.” In April this year, Sharma’s My Shower was showcased in Burn, an online journal edited by Magnum photographer David Alan Harvey. My Shower is a set of beautifully composed pictures that showcase Sharma’s talent for portraits. It began when Sharma noticed that for one hour every day, sunlight poured into her bathroom and transformed it. She started inviting friends to model for her in her bathroom. As the series developed, Sharma felt as though she was creating a “personal mythology”. The tight frames have a tender intimacy to them and her models look like they’ve been gentled into a photograph, rather than captured. Their intensely private moments offer references that range from the purification of a baptism ritual to playful sensuality. My Shower is Sharma’s first major work and it has won her significant acclaim. It’s also a rare example of work that belongs in both the fine art as well as commercial brackets. Bathware manufacturers Grohe commissioned Sharma to create a similar set of images for an upcoming ad campaign. It appears the twain can meet. Sharma said her greatest challenges included packing a 30-person crew into a bathroom and “getting the models to relax and forget for a second that this is not a Liril commercial”. The photographer acting as the director is a new phenomenon in Indian photography. In the past, fine art created with the camera was a solitary venture. For example, Raghu Rai’s famous photographs of Indira Gandhi emerged out of the photographer following her around. Similarly, the candidness in Pablo Bartholomew’s brilliant series on heroin junkies in Delhi’s Pahargunj came from the rapport he as an individual was able to establish with his subjects. Today, however, there is a distinct move away from documentation in the traditional sense. Fine art photography has become a viable option and photographers like Bharat Sikka and Shahid Datawala make clear distinctions between commercial photography and the work of documentary photographers. Perhaps as a result of the unavoidable advertising imagery around us, there is a keener awareness of how artifice can be insightful. Whether it’s through performance in the works of artists like Pushpamala N and Tejal Shah or even Photoshop, which is gaining grudging acceptance, the artistic potential of fabricated reality is being celebrated by artists who use photography in their works. Chennai-based photographer Nandini Valli Muthiah, for example, created the gorgeous The Definite Reincarnate series with the meticulousness of a feature film. She began the series in 2003, while completing her second BA in photography from the University of Bournemouth, UK (she originally studied English literature before stumbling upon photography). Her holiday project quickly became quite elaborate. 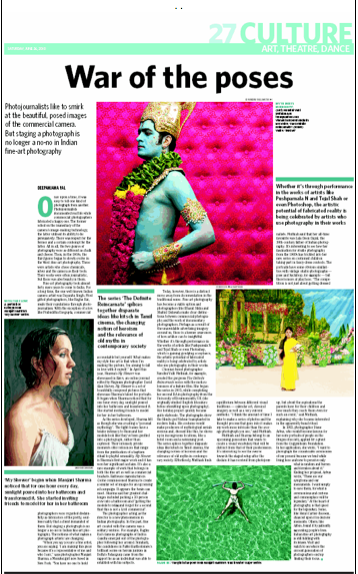 The photographs show the Hindu god Vishnu transplanted in modern India. His costume would make producers of mythological serials envious and, dressed like this, he shows up in incongruous locations, like a hotel room and a swimming pool. The series splices together disparate ideas like kitsch in Tamil cinema, the changing notion of heroism and the relevance of old myths in contemporary society. Effortlessly, Muthiah finds equilibrium between different visual traditions — calendar art, classical imagery as well as a very current aesthetic. “I think the amount of time I take to make a series of photos and the thought process that goes into it makes my work more intricate than the average photograph you see,” said Muthiah. up, but about the aspirations the parents have for their children and how much they coach them even for such an event,” said Muthiah, explaining why she became interested in the apparently banal ritual. In 1963, photographer Diane Arbus, who would become famous for her eerie portraits of people on the fringes of society, applied for a grant from the Guggenheim Foundation. In her application, she wrote, “I want to photograph the considerable ceremonies of our present because we tend while living here and now to perceive only what is random and barren and formless about it.” Ending her proposal, Arbus wrote, “These are our symptoms and our monuments. I want simply to save them, for what is ceremonious and curious and commonplace will be legendary.” At the heart of photography is that quest for the legendary. Some, like Henri Cartier-Bresson, chanced upon it in decisive moments. Others, like Arbus, found it by patiently excavating people’s lives. Indian fine-art photography is still fiddling with its lenses. Wait and watch to see where the current generation of photographers end up finding their focus.